Equity investors have of late been getting a rush of adrenaline with every new stock on the block. This is because the rush of investors for initial public offers, or IPOs, means huge gains for those lucky enough to be allotted the shares. 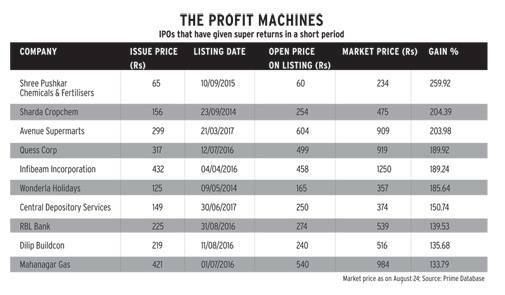 Since January this year, 12 companies have come out with IPOs, which have given an average return of 51 per cent, according to Prime Database. Of these, the eight that listed in the first quarter of the financial year gave an average return of 40 per cent. These include CDSL and AU Small Finance Bank. But D-Street is divided over whether these returns are justified or a build-up to a future bubble. "We are fast. We are approaching the furious. We are at the fag end of the boom," says U.R. Bhat, Managing Director, Dalton Capital Advisors (India) Pvt Ltd. Prithvi Haldea, Chairman, Prime Database, does not agree, "We are far from any IPO bubble. Valuations of IPOs are sane. Besides, there is never a perfect valuation. If there was, there would be no buyer and no seller." Whatever the realty, one thing is sure. 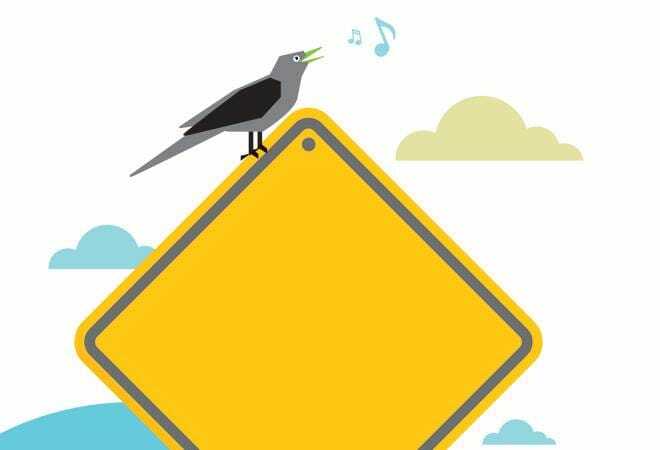 The kind of euphoria one is seeing in IPOs means it is time to be cautious and stick with fundamentals of companies rather than go with the flow. "We've had two great years in the primary market. This is the third year. I believe the market is a bit overheated. We are ahead of fundamentals. But investors are taking comfort in economic reforms and political stability," says V. Jaysankar, ED, Kotak Investment Banking. Strengthening rupee, normal monsoon, narrowing fiscal deficit, low inflation, smooth rollout of GST, steady inflow of foreign capital as well as retail and DII (domestic institutional investor) money have made shares of even average companies winners in the stock market. The liquidity rush from DIIs has been a defining factor. While FIIs have pumped in Rs 23,621 crore in Indian equities in the past one year, the figure for DIIs is Rs 78,850 crore. "In the last six months, DIIs have pumped in more money than FIIs, the ratio being 2:1," says V. Jaysankar. The Dalton MD says the macro picture is fine. "The fundamentals appear reasonably strong. But some large sectors such as banking, pharmaceutical and IT are in a mess. Sentiment is driving markets, and while it is bullish, it is not enough to support the levels of today. On a fundamental basis, 2019/20 numbers are being used to justify valuations. How is that not a sign of froth?" The listing gains of 150-200 per cent in a few trading sessions or a month, even for quality companies such as Avenue Supermarts and CDSL, signal froth. The wide public participation and high leverage and oversubscription are all signals that there is a lot to be worried about. Talk to Sharad Poddar (name changed), a Gujarat-based retail investor, and you'd know why experts are cautioning about IPOs. He is the first generation in his family to enter primary markets and believes he can't go wrong with new issues. "I'll apply in all IPOs. I'm sure I'll get some allocation in at least a few of them. If not, I can always buy on the listing day and sell to make a profit the next day, like I did in DMart," he says. Such naivety reminds one of the reckless behaviour of retail investors and aggressive behaviour by punters just before the 2007/08 financial crisis. Investors are looking at the rear view mirror and investing ahead, say experts. Spectacular past returns ensure a liking for all IPOs. 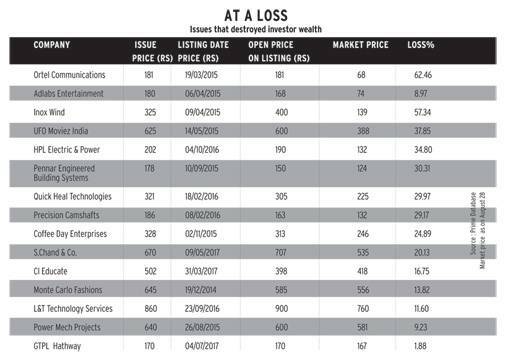 In 2008, it was RPower that ended the IPO boom when it tanked after listing. Which company will do it this time? Not that everything is hunky dory in this market. Even in this bull run, there are companies that are showing a performance drag. Coffee Day Enterprises Ltd, which listed in October 2015, is down 25 per cent from its issue price. Inox Wind, Ortel Communications Ltd and Adlabs Entertainment Ltd, which listed in March 2015, are down over 55 per cent, while Quick Heal Technologies Ltd has posted a negative return of 30 per cent since its listing in February last year. S. Chand and C.L. Educate, which listed in March and April, respectively, are also trading below their issue prices; they have given negative returns of 17 per cent and 20 per cent, respectively. "IPOs should not be put on a pedestal. Besides, why treat all IPOs as homogenous? The decision to invest should be based on disclosures, track record, management and pricing," says a bullish Haldea. With allocation to retail investors capped at 35 per cent and gush of liquidity, the demand-supply dynamics play out and benefits investors, he says. Jaysankar says this frenzy will even out the demand-supply gap. "With half-a-dozen large IPOs hitting the market, a lot more allotment will take place, new pools of money will come in, and global accounts will participate by investing in marquee companies about to float. This could change the dynamics of the paper supply and the ratio of DII and FII investments." 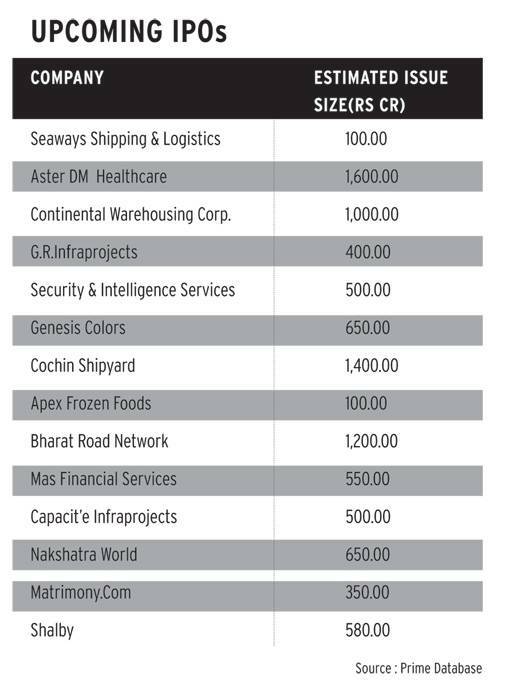 According to Prime database, 14 companies, including Cochin Shipyard, Matrimony.com and Bharat Road Network, have received Sebi approvals and are slated to list this year. Another nine have filed the offer document. Among these are some large names like National Stock Exchange of India Ltd, Indian Energy Exchange Ltd, ICICI Lombard General Insurance Co Ltd, SBI Life Insurance Co Ltd. and Godrej Agrovet. Not just this, Reliance Nippon Life Asset Management, UTI Asset Management, National Insurance Company and General Insurance Company are also in the pipeline to woo investors. Analysts feel that unlike the previous bull run, where power and infrastructure were the popular themes, this time it is the domestic consumption theory that is being bet on. This will minimise risks from global factors. So far, the bulk of the fund-raising has taken place through qualified institutional placements. In the first quarter of this financial year, Rs 33,000 crore has been raised through the IPO and the QIP route. This figure, according to Jaysankar, could reach Rs 1.25 lakh crore by the end of March 2018. Jaysankar is, however concerned and says listing gains of 50-70 per cent in some companies should not be a benchmark for future listings. "Future listings should be priced right and not viewed as a way to fetch sky-high returns like the returns given by some IPOs in the recent past. The grey market is also a reason for concern as it paints a different picture and has no correlation with fundamentals." "When markets are excited at listing, we are typically at the end of the boom cycle. I am afraid we might be approaching the end of the boom. What worries me is that merchant bankers will be under tremendous pressure to price issues on a par with others. This is when pricing will get aggressive. No parameters can justify that kind of pricing. This means either the listing or the secondary market will collapse," says Bhat. In both the above situations, the retail investor stands to lose. Not just this, when big-ticket IPOs that are lined up hit the market this year, a lot of money will move from secondary market to primary market. "There is only so much money to meet the paper supply in the market," says Bhat. So, how should retail investors play the IPO game? "Investors should see if the private equity player is fully exiting the company. This reflects a lack of confidence in the company and is a red signal. Also, retail investors should have an exit strategy and learn to define their losses and profits, avoiding greed," says Haldea. Bhat says the retail investor is always at a disadvantage. "There is information monopoly. With 300-page prospectuses where negative information might be hidden or cleverly written, companies just about meet the entry norms and merchant bankers never undervalue the stock." Unlike the secondary market, appropriate information for the primary market is not easily available for investors to make an informed choice. So, before you jump into all IPOs head-first, remember that the Oracle of Omaha is not a great fan of investing in IPOs either. Warren Buffet says it is a mathematical impossibility to imagine that, out of a multitude of stocks to buy from, the most attractively priced would be that single company making its debut on the bourses at a date, time and price chosen by the knowledgeable seller to a less-knowledgeable buyer. So, while you ride the IPO bandwagon, remember to put on the safety belt to avoid that furious crash.